The machine is called 'slate', and has a single 32Gbyte disk. The xen host is running (a very old) Fedora 8 with xen-3.1.2-5.fc8. # Use VNC for the console. 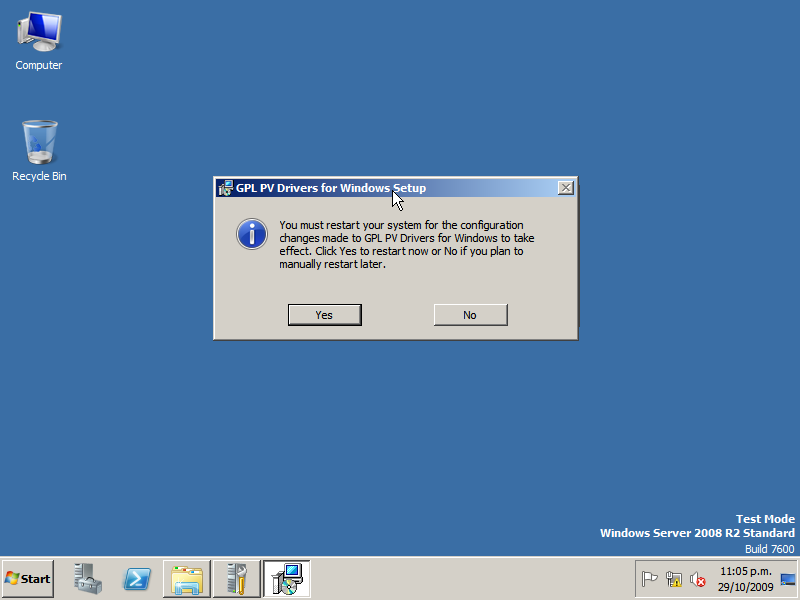 Note: A Windows Vista x64 machine was used as the VNC client during installation. For some reason connecting to the VNC session over a Putty SSH tunnel using the loopback interface didn't work (the connection hung during the initial handshake). Binding to the ethernet interface of the Xen host, and going directly worked well. 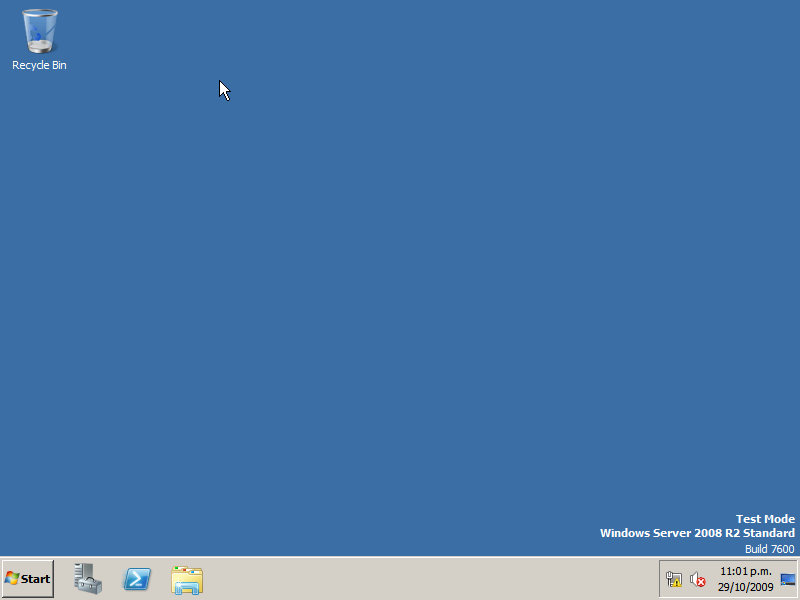 Given the Windows machine is Server 2008 R2 x64, the drivers must have 'wlh' and 'amd64' in their name. 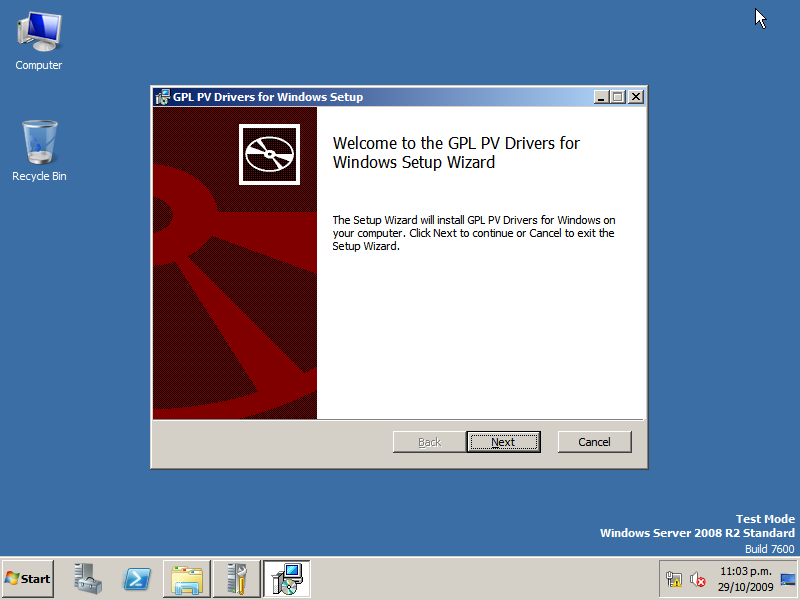 The current revision is gplpv_fre_wlh_AMD64_0.10.0.130. 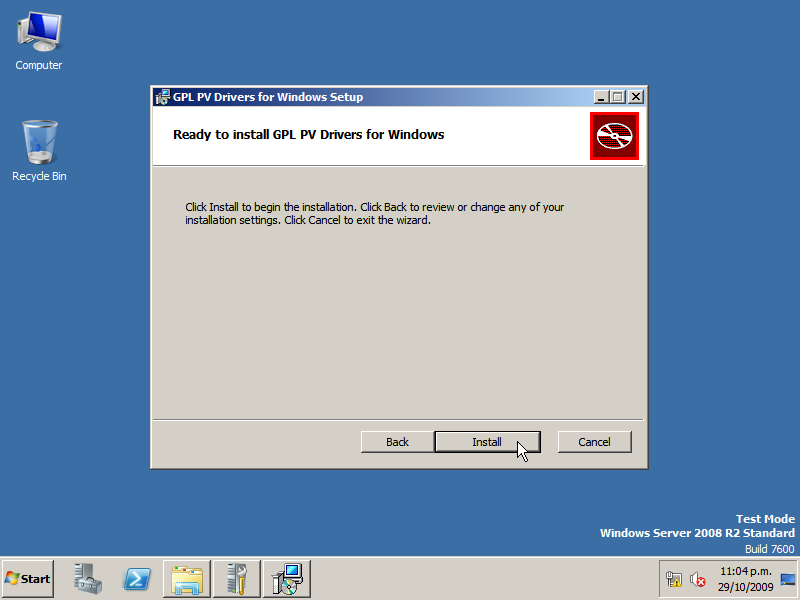 The installation of the drivers was very straightforward. 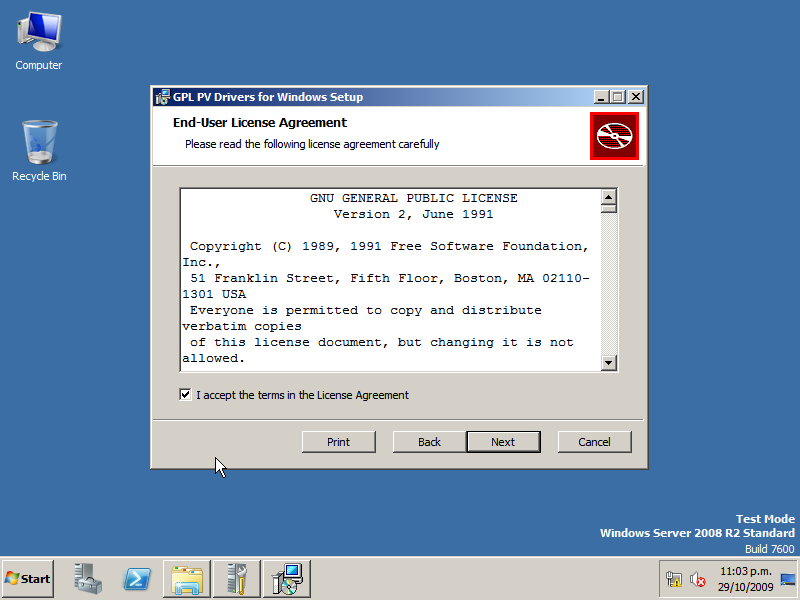 Given the drivers are signed for 'test mode' operation, and a certificate is provided, the pain to get the drivers installed is reasonably low. I created an ISO image with the MSI install program on it, and added the ISO image as a CDROM device. This means the qemu network adapter doesn't have to be used or configured (but this would be another way to get the drivers onto the machine). 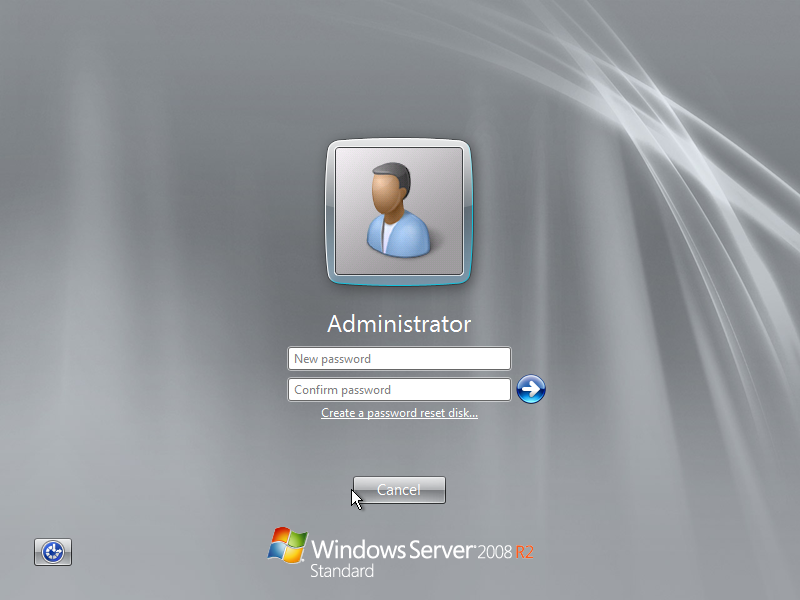 Once the driver was installed and the machine was rebooted, I configured a static IPv4 and IPv6 address on the network adapter, and enabled remote desktop. 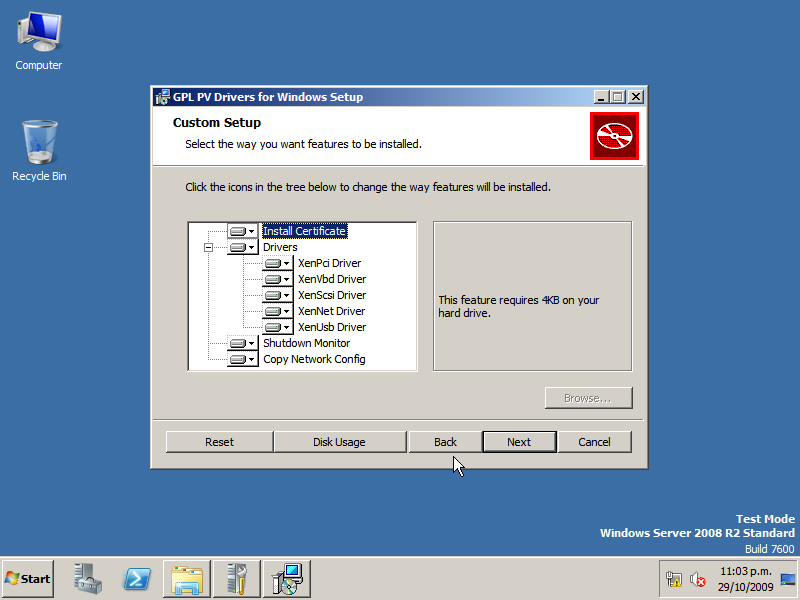 Device manager indicated that the driver was being used, by the presence of the 'Xen Net Device Driver' and 'Xen PV Disk SCSI Disk Device'. Note: The shutdown service works well 'out of the box'. Shutting the machine down from the xen host with 'xm shutdown slate' performs an orderly shutdown. 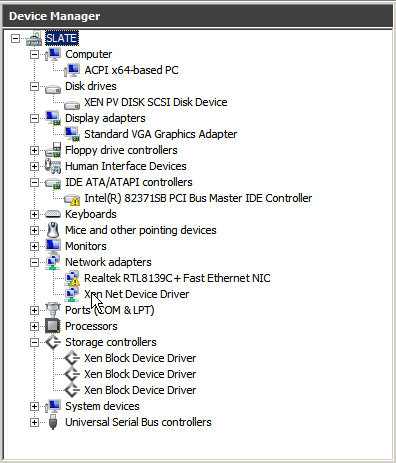 Given I am running an old version of xen in domain 0 (v3.1.2), there is an issue with using the GPL PV driver such that the CDROM devices no longer function, and the 'Intel(r) 82371SB PCI Bus Master IDE Controller' device has an issue. Upgrading to the latest xen would solve this issue. Ready to install. Pick the time and currency format. 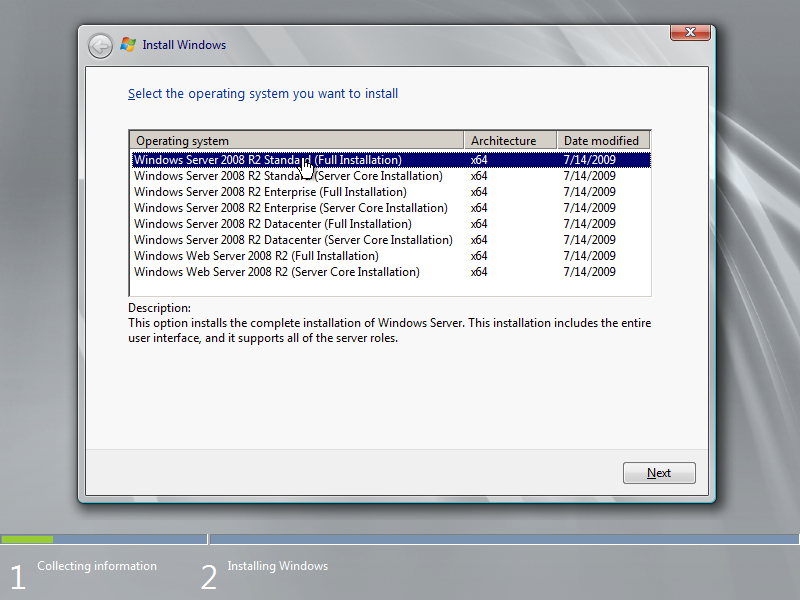 Select which version of the operating system to install. Accept the license terms (like there is a real choice). 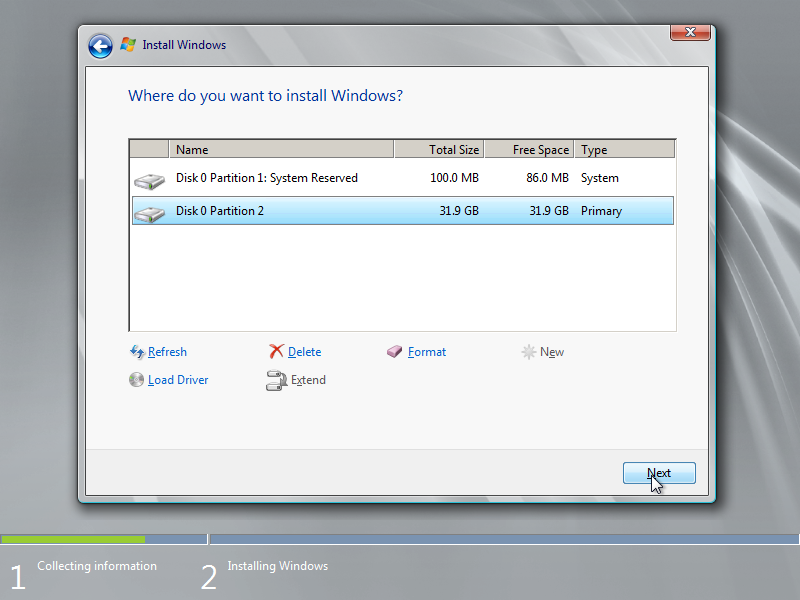 The install program creates a 100MByte partition. There was no choice. Installation begins. 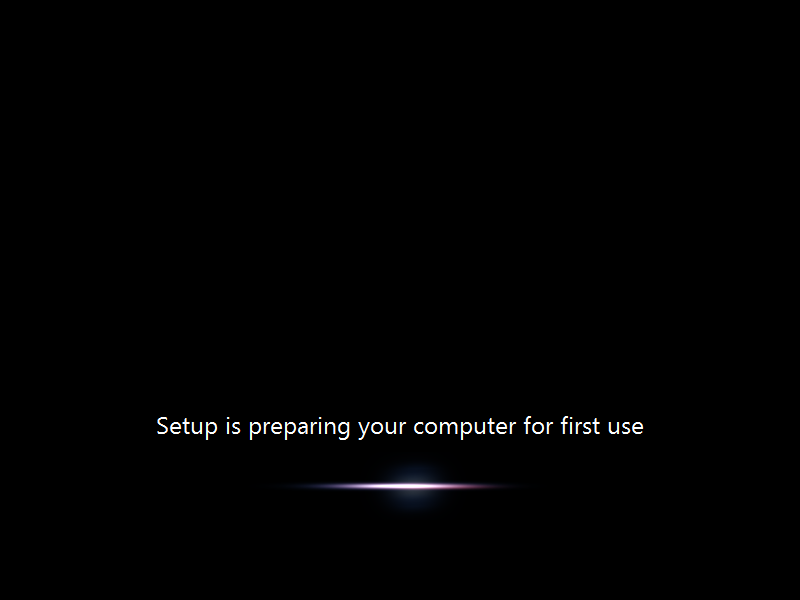 Note that the machine does reboot during the install. Overall the installation was reasonably easy and quick. Once the "bcdedit /set testsigning on" is run, and the machine has rebooted, the 'test mode' should display in the lower right of the desktop. Run the GPL PV driver installation msi. The custom install shows what will be installed. 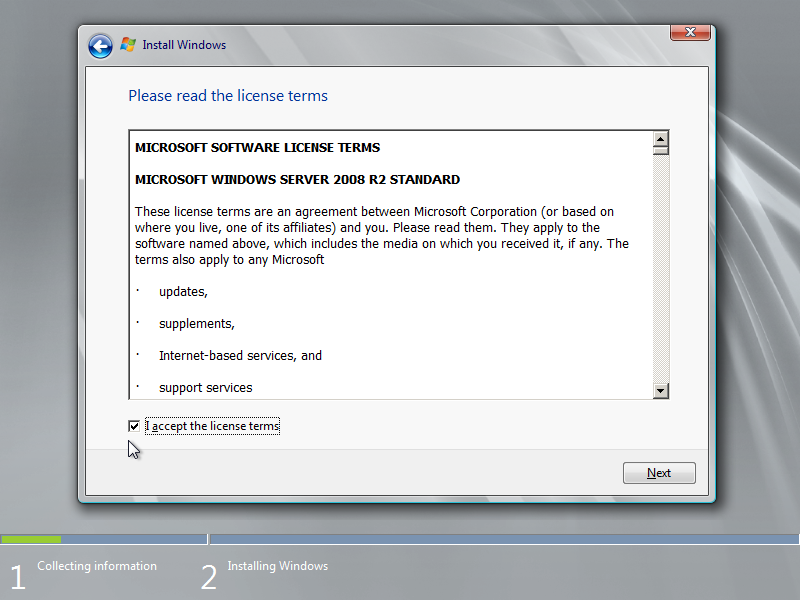 Note how the 'test mode' signing certificate is installed. 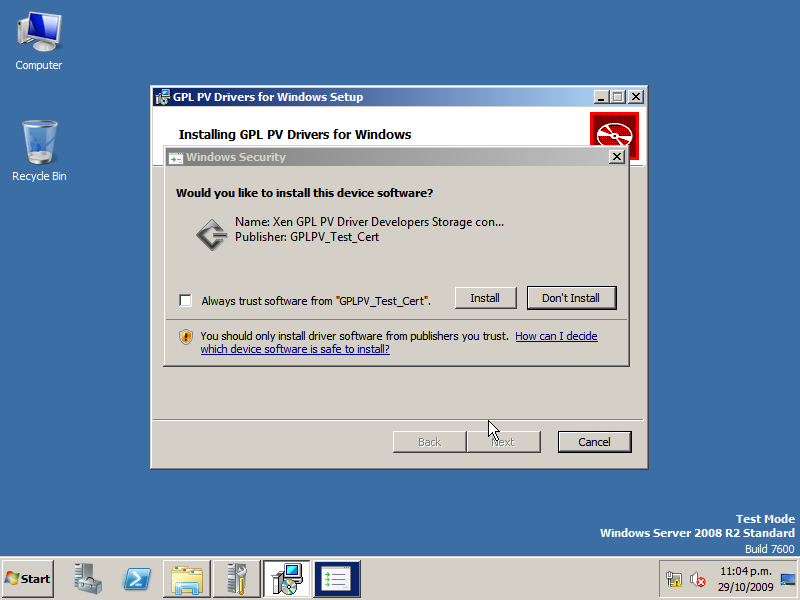 Install the drivers, and always trust the 'GPLPV_Test_Cert'. Reboot the system to activate the drivers.